I wrote this song when I was camping on the Russian River in northern California several years ago. Finally got it mixed... Took a LONG time... Mixing is very difficult for me... But here it is... What do you think? I found it relaxing. I think the sound of the Russian River at the end of the day would be just so very very relaxing. Thanks Stone Dog. I had a LOT of help mixing. It is NOT my forte! Pretty cool. I kept waiting for you to play some violin in there! Ha. It's a nice melody though. Ok, first thing.. Very nice song, sus49! Bravo! Mix is good, the sound is evocative and coherent, and not derivative as far as my ears can tell. So not only a good song, but a new song with a distinct and cool sound to it. Nice work! cdennyb & Fiddlestix: I definitely hear some strings in there. At some points there is what sounds like a string section or group of violins and in some places there is some sound that is more like cello. It is in a supporting role to frame the vocal melody rather than busting out into the front with something that sounds like The Devil Went Down to South Carolina or Paganini's Cappuccino #24 for a solo or whatever.. But bowed strings or something that sounds a lot like them are in there as a part of the piece. It can be hard to tell for sure where one is hearing a keyboard string patch or electric violin with some fx (or even acoustic with fx maybe added after the initial recording). So I can't be 100% sure how it was done, but I'm pretty sure I hear bowed strings in some form in there. Not that it matters, I guess, since the "Share" forum isn't labelled as being strictly violin, but "Ideas, tunes, sheet music" and this was certainly an idea/tune and quite nice. ...for sus49. I liked this. Good song, and I hope sus49 keeps us informed on the progress of the CD project. More folks here should be thinking/working towards something like putting out a CD of their work. All present company most definitely included. @DanielB: I think you are missing the point that Dennis and I are making. We thought that maybe it would be more of a violin solo. I think the song is great with a nice soothing melody and I do hear strings in the background. We were not critiquing the piece. I would really like to hear the CD when it is released. And you may be right about other's working on a CD project of their own. When will yours be released ? I gotcha, Ken. I was just making a point that violin is a versatile instrument that can do many jobs, and supporting a good sung melody is also an excellent use for it. It isn't what we usually hear here, but I think it sure is an important part of what it can do. I wasn't saying that you or Denny were critiquing, I was just reminding myself not to start dissecting the mix and etc, and to get back to the "Bravo!" My own CD? I have been working towards it, Ken. Writing and practising new pieces, working on some of my own simple arrangements of traditional pieces, taking classes on music, recording, engineering, production. Been getting in a bit of practice with my recording gear and software, because 'education' is only worth so much without some experience to go with it. So it is a work in progress. I don't know when I'll be releasing it. Until I get the song list finally decided and start getting getting pieces practised, polished, recorded and "in the can" I don't feel it is realistic to think about a release date. At present it is kind of like when you are saving up for something you want or want to do. The money goes into the piggy bank or account, and every week you are a bit closer. Sometimes just a little, but sometimes more. It adds up, and someday that goal can happen. The point I was making with mentioning it? Well, you know me and know I don't like to sit around talking about who plays good and who maybe needs more work and so on.. But I can say with much faith that all of the people that have posted so far in this thread, there is no doubt in my mind that each has both the talent and the brainpower that they could put out a CD that people would likely enjoy listening to, if they decide to do so. Maybe this year, maybe next.. Especially you, Ken. You play great, and I'd have a hard time imagining anyone not enjoying hearing you play. There's plenty of others in this community too, but I'm not going to play expert and point fingers. Lot of talent here and a lot of people with the music in them. I honestly do believe that, and I am not kidding at all. A couple weeks ago I was in my luthier's shop. Mark's apprentice, (David), said, "hey Ken, here's a copy of our new CD, we finally got the cover artwork finish" I said thank you for that. On the drive home, I plugged it in my car CD player and listened. (David is a professional cello player and has a band). Well, I listened intently to hear a cello in the back or lead. I listened to the whole CD. A couple weeks later I went back into the violin shop. David was sitting there working on fitting a bass bar for a violin. I said "I listened to your CD", and he replied with a smile, " what did you think", I said, " I like it, but I didn't hear your cello", he laughed and said, " there is no cello, I was playing bass guitar in it". So I guess it's about the same difference, EH ? I did some vocal stuff, mostly all talking of some background details related to each tune I was going to play and then played it. I then saved each tune I played and after I was all done I burned a CD of them. I only made one CD and listened to it on my entertainment center stereo... WOW soudned better than I had hoped it would... and of course we are all our worst critic and I was able to hear a few boo-boos but for the most part it all sounded pretty decent. So when my daughter came over to visit one day last week, I gave it to her and told her that I was a famous highly paid (Streetjelly tips totalling $37.00) violinist! This was a limited edition CD (Very limited in fact, only one burned!) and she should keep this for all time since in about 20 yrs it would be very valuable. When she got home she called me and said how incredible I played (apparently she listened to it on the way home), that she had no idea I could do that! Made me feel good. I guess all my hard work and late night practicing are worth it. I think everyone should record their practice tunes when they feel they are good enough to move on to the next one. Then when you get a bunch saved up, make a CD, cheap Christmas presents to hand out to family memebrs for sure! I am going to burn my own cd.. its been years since I burned anything. So Without all the fancy stuff. Can I download from Soundcloud and then burn?? Yep... just store/save all your tunes you want to record in a "Playlist" and drag it into the CD folder, hit BURN. From the recording and production quality, I assume that sus49's track is probably part of a commercial release that sus49 is working towards. Which is great, excellent, and a very worthy project for any musician. Before some folks get the "Oh, I couldn't do that.." thought going about their own playing/music, a project does not have to be mixed/engineered/produced at that level to be worth doing. There can be a lot of good reasons to work towards something like a CD project. Sure the odds may be extremely small that you'll make it onto the Billboard Top 10 or other "famous" degree of notice. But the process, from thinking about what songs you would like to put on something like a CD to deciding what you'd like for cover art, it can give some direction to what you do as an artist and make practice feel more like it is work towards.. something. It can get you thinking about who you are as an artist/musician, what you are trying to say to the world (or at least the people that may give it a listen). So far as I ever have seen no method book and only a few teachers out there will tell you that you need to do that. But it is an important part of developing as an artist/player/musician. Getting a clearer idea of your direction and what you are trying to do can help keep your inertia up and give a reason to "why should I practice today?" Maybe even a reason to put in another 15 min or so now and then. CDs and even single recorded tracks can also get people interested in what you are doing. That can lead to having listeners, but also to meeting other musicians who might be interested in collaborating or who will give at least their moral support. It can also be enough to get you into some talks with engineers, producers and other folks that you might never meet otherwise. You just never know how far it can go. You also may make some money at it. I can already hear folks out there saying "and you might NOT.." LOL I will agree that is true, but point out that if you don't put anything out, then "NOT" is more of a sure thing. If you put out some tracks, and especially if you also make them available as a CD or something that people can maybe listen to in their car or etc easily, then the possibilities are there. I won't kid you, I never made a fortune on putting out CDs or tapes or etc. But my last CD project was back in about 1999 and I did make enough to pay some bills and to buy a new computer. More interesting to me is that even after that many years, I still sometimes get contacted about it, or (once in a blue moon) meet someone who actually heard and remembers that music. It isn't just CDs or commercial type releases either. Recently I ran into someone I met at a Christmas party over 20 yrs ago. At that party, I played a tape of some stuff I had thrown together as holiday music. It wasn't anything fancy, a half dozen little instrumentals that were either single instrument or minimal multitrack where it was one instrument playing melody over a track of accompaniment on another instrument. In the course of the assorted "Hey what are you up to these days" talk, they asked if one of those pieces had made it into any of my projects. It had been over 20 yrs and they could hum enough of their favorite one that I was able to remember it. No, it hadn't. It had been a one shot recording with only one tape copy and the tape is long dead (probably recorded over, as well as worn out and discarded). But finding out that someone remembered it well enough through all those years to be able to hum it back to me? Oh, it sure as heck WILL be! LOL Any piece with the potential to be that memorable to anyone is definitely one that deserves to be developed, practiced, polished, recorded and put out for people to hear. 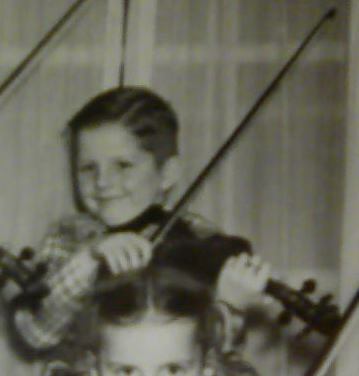 Especially considering I play some actual violin these days, and back then it was just a violin "patch" on an electronic keyboard. I worked it out on violin and it went right into the top rotation list for my current practice pieces. It definitely is slated for the current CD project, and the person (who I only briefly met at that party long ago) was added to my list of listeners who get to hear all the rough little bits of things as I work on them and get kept up to date on any projects I'm doing. Back to the point though.. If there hadn't ever been a tape, if there hadn't been CDs put out, and if people hadn't gotten to hear it, some cool stuff probably just couldn't have happened. It is a worthwhile activity, and there can be some nice ripples from it for years. As an artist/musician, you do not want to miss out on the possibilities. Thanks @DanielB I am glad you noticed that it is not derivative. I am trying to do music that does not just sound like everybody else. I call it Imagic music because I am trying to make it sound like what it is about. I have been working on this project for years. Although I have written, composed, choreographed and performed paying gigs for almost 50 years I have never put out a CD because I am too much of a perfectionist. The horrible thing about recording is you can't get over using performance and energy. Each note is recorded with the same emphasis. In performance if you make mistakes they disappear into the ether and nobody recalls them unless it was a REAL WHOPPER. In recording every time I listen I dread the mistake in advance, hear it then regret it after the fact. Being a perfectionist is NOT A GOOD THING because you can NEVER EVER achieve perfection and it just makes you hate yourself! MY strongest advice is DO NOT BE A PERFECTIONIST it means you NEVER REALLY achieve ANYTHING!!! A composer friend challenged me to put something out, so I am finally doing it. AND I AM GOING TO PUT IT OUT even though it is almost three years now since I got the challenge. But I am very closed to finish. Just doing final mixes on the last two songs now. Oh, I hear you on the "perfectionist" thing, sus49! I have never been even near 100% pleased with any recordings I put out over the years. But an important learning experience can be to find out that even though you feel it was far from perfect, listeners may still like it and not hear the flaws that you do. Or then there's the people that will spew off a critique, and after you read it, you're still wondering "Ok.. I already knew all that.. But did you like it????" Get that music out, sus49. It is sounding GREAT!